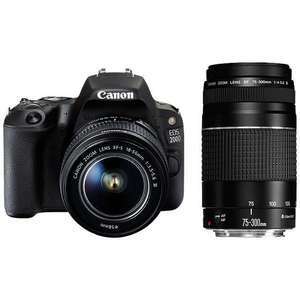 Seems a good deal with both the 18-55mm lens and EF 75-300mm lens. Also 2 year guarantee with John Lewis. Why is it the 7D ll and 5D 4 are hardly ever on offer? anyone got one of these that have any views. Just bought this recently, but mainly as it's great for video with the auto focus system. Highly rated when you check reviews as it has same sensor as the 80D and a newer processor. Bought this last week, highly recommend. However, be aware that the 70-300 lens has poor reviews, and can be bought for £100 separately, so may or not be worth it over cheaper deals without it. £50 cheaper at Park Cameras. You don't get the 70-300, but you do get STM on the kit lens. PS, I've given this deal heat. It's good, just consider which is better for you.